I grew up in Chicago in the 90s, and my entire family (and really, the entire city) was completely obsessed with the Chicago Bulls basketball team. Scottie Pippen is my all-time favorite player, and I'm still a huge fan of the team (though they have the tendency to break my heart more these days than they ever did in the 90s). The most dominant player of the 90s era (and possibly of all time) was Michael Jordan. Pretty much as soon as I saw that there was a new-ish biography out about Jordan, I planned to read it. Looking back at Jordan's time with the Bulls, it is amazing that the team did so well so consistently for so long. I really wanted to look back on that amazing period. 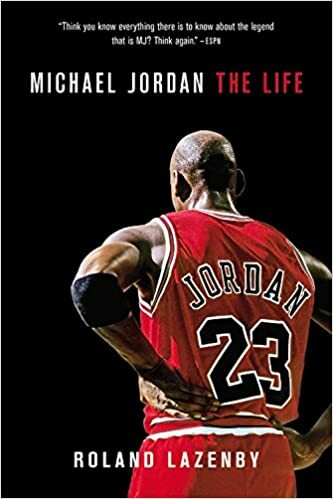 Michael Jordan: The Life, by Roland Lazenby, is an account of Jordan's life, including his family, close friends, and his very volatile relationships with the teams he played on. Quite honestly, I don't know if this book would appeal to anyone who is not a big sports fan in general or a huge Bulls fan in particular. I debated whether I should even write a review because it's hard to be objective about a book when it's about a childhood hero. I'm certainly not an objective reader here. Lazenby's book is very detailed. There's a lot of time spent on Jordan's family history and his childhood, which I really appreciated. There's also beautiful writing about the games Jordan played, the way he moved on the court, the way he could dominate everyone. I wish that the book had been a more multimedia experience; so many times, I wanted to go to YouTube and find the play that Lazenby was describing. What comes across on almost every page is just how competitive Michael Jordan is. He was able to pump himself up for every game, wanted to win every single game. When you consider that the regular season of the NBA stretches from November to April and includes 82 games, that is absolutely mind-blowing. He competed not only with other teams, but also with his teammates, forcing them to get better, and with himself, always drilling, always pushing to see how much further he could go and how much better he could become. He rubbed a lot of people the wrong way. But the fans hardly ever saw that; they saw an amazing player, a team leader, a media darling. And, of course, they saw all of his commercials. Nike, Gatorade, McDonald's... but mostly Nike. I was fascinated by the Nike deal and all the implications that contract had for Jordan and for Nike. But fame and fortune have their drawbacks. And someone so obsessed with competition and winning can easily become addicted to something like gambling. Michael Jordan gambled a lot. And for huge sums of money. He also had a large family and group of friends that depended on him for all sorts of things, and the massive sums of money he made created a lot of tension with them, too. As a fan, you really only see your team on the court. To you, they don't really have anything else going on. No personal lives, no triumphs or failures, no issues with teammates or family or friends. All you care about is how they play. In that way, I really appreciated Lazenby's book. I enjoyed getting a peek behind the Bulls organization of my childhood and understanding just how special that team was. This sounds like such a fascinating book! I love biographies and memoirs that are able to show you a new side to someone or something that you already love. It seems like reading this would be like pulling back the layers to get a more complete and complicated picture of who Jordan is and was. Thanks for the suggestion! I never was a basketball fan, really, but even I remember watching Michael Jordan. I'm afraid that a look behind the scenes might destroy some of the magic though. Awww. I think it's really sweet that you have so many good memories about the Bulls from when you were a kid. That's adorable. I haven't got any sports memories from childhood (except an undying affection for Pete Sampras). I too was a big Bulls fan during the time when Phil Jackson was the coach. I guess I'm really a Phil Jackson fan. Watching all of those players was so enjoyable. I've managed to follow quite a few of the players and they have moved on from their playing days. I think this book would be very interesting to read. As a 90s kid myself, I distinctly remember the hype around Jordan and the Bulls. I think Jordan was my introduction to the extremely wealthy. The concept hadn't really hit me before.